We want to say a big thank you to everyone who took part in this year's Recovery Festival - whether you came along with friends, helped behind-the-scenes on the day, or took part in the programme of entertainment and activities. The Recovery Festival celebrates the journeys and achievements of those who don’t often get the opportunity to shout about how far they have come. Bringing People together for the festival is an opportunity for those in recovery to do just that, inspiring others to start their own journey in the process. The Recovery Festival is a free annual event packed with live entertainment, activities and guest speakers to help celebrate and showcase the achievements and talents of people in recovery from across the South West. This year's festival was held on September 1st, kick-starting Recovery Month, at the new site of St Agnes Park and St Agnes Church. This year the Recovery Festival steps out in a new direction, in a new community location, and provides Bristol with another unique, ground-breaking event. Highlights of this year's festival included the return of BDP's drama group and Rising Voices, Bristol's Recovery Choir. 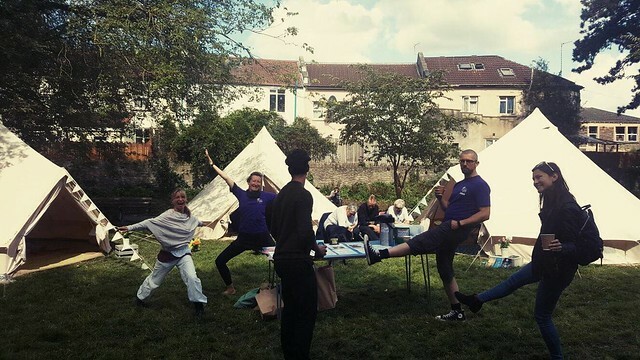 Activities included yoga in the park, holistic therapies and a circus workshop provided by Circomedia. The Mutual Aid taster tent allowed people to try a variety of support available in the community, while DHI Peers provided fun art and crafts for the whole family. I stopped drinking about 9 months ago and one of the things that came up was this huge emotional void. Singing with the recovery choir has helped me fill this. This year's expansive film offerings included screenings from Digital Witness and Golden Key. It also marked the first year that Bristol hosted the touring Recovery Street Film Festival - screening shortlisted films made by people in recovery from across the UK. The Recovery Festival is organised by a group of individuals from the recovery community, peer-led communities and local alcohol and drug treatment service providers.